* 3D Support: Works for true 3D gaming and 3D home theater applications. 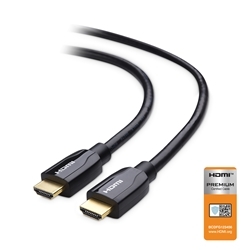 * HDMI Ethernet Channel: Adds high-speed full-duplex 100 Mbps Ethernet networking to an HDMI link. * Audio Return Channel: Allows an HDMI-connected TV with a built-in tuner to send audio data "upstream" to a surround audio system, eliminating the need for a separate audio cable. * Content Type Support: Real-time signaling of content types between display and source devices, enabling a TV to optimize picture settings based on content type. * Additional Color Spaces: In addition to RGB color and x.v.Color, it adds support for sYCC601 color, Adobe RGB color and Adobe YCC601 color.